It is a rare privilege to meet someone who has truly found their vocation - whose creative spirit and joy de vivre is so purely, so perfectly, articulated in their art. Amanda Brisbane possessed and shared that gift. 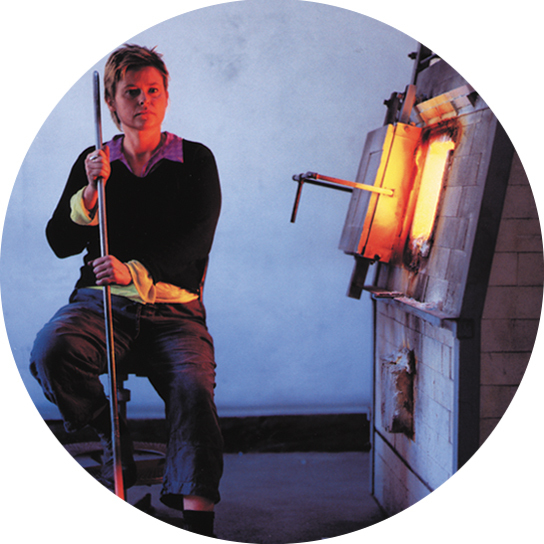 The energy and passion that she demonstrated throughout her life is embodied in every glass sculpture created during her too short life – a fitting and lasting tribute. The story began when her imagination was captured by the blaze and heat of the furnace. Its raw, powerful intensity mirrored the fire in her heart and enabled her create beautiful, celebratory pieces of glass; each unique and born of the moment. An English eccentric with a profound love of colour, textures, nature, travel, culture, people, penguins, parties and all the experiences that life offers; Amanda harnessed inspiration from all she encountered. The smallest, most intricate details of the world she experienced were translated into fluid, organic glass forms – spontaneous and full of vitality. She embraced the here and now – shared and spread joy with the broadest smile, an infectious laugh and a generous, kind heart. In her commissioned pieces she had an innate ability to listen, engage, understand and interpret other people’s ideas – turning them into something real, something tangible, something ‘fabulous’. Amanda believed in the simple truth of the work she created, joy with the broadest of the making process, embraced and lived life to its fullest, She absorbed everything around her and gave back in equal measure. She questioned whether that sounded too selfish, too self-indulgent. But what she wanted to convey in those words was a celebration of self-discovery; loving the place that she had reached and the freedom it gave to express herself. Amanda had discovered the way to ‘be brave, speak the truth… make peace. Be strong… love patiently… give good measure’* and let work be her prayer. And so, we are left with a wonderful legacy in her glass sculptures - a permanent reminder that we must all cherish life, capture the moment, celebrate the world around us and all that is in it.